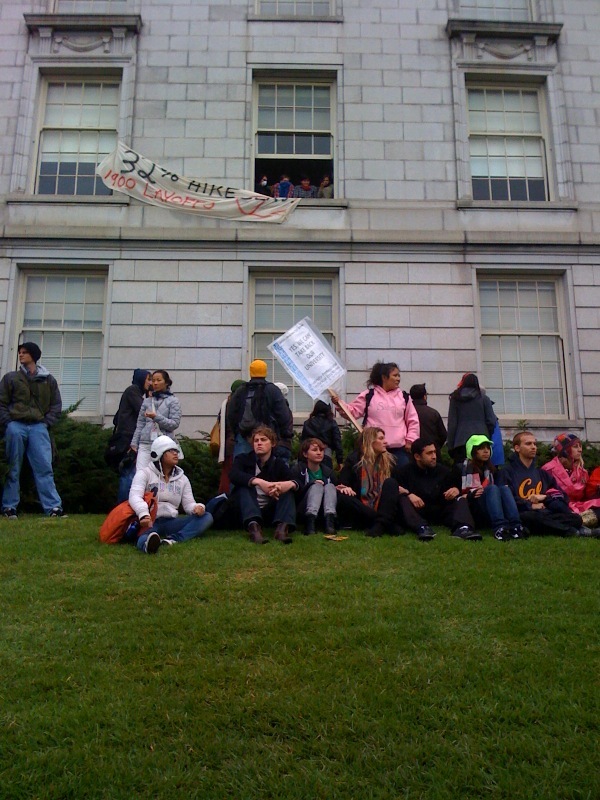 CALIFORNIA – Students and faculty at around 4 California State University campuses held sit-ins today in administration buildings. Sit-ins and marches to administrative offices took place at: CSU Fresno, Monterey, Sacramento, East Bay, Long Beach, Pomona, Northridge, San Francisco State University, and San Jose State University. Rallies, marches and teach-ins were scheduled at all 23 CSU campuses today as a part of a day of action. AP estimates more than 10,000 participated. According to AP, around 1000 students and faculty at CSU Sacramento marched from the library quad to an administrative building to deliver a set of petitions, and around 100 demonstrators staged a sit-in demanding the resignation of the CSU Chancellor. Around 800 demonstrators at CSU Long Beach marched to the student services administrative building, but the building was already shut down. These actions take place in the face of the $500 million budget cut to the CSU system (out of a total of $1.4 billion in cuts to CA higher education). 7:30pm: Reportedly, Sac state students inside their administrative building are staying overnight. 7:00am: Doors to the admin building are scheduled to be opened. As of a few minutes ago the folks sitting-in are still there. TV news and other press are already present. ~10:00am: Some classes are being held in the occupied space of the administration building. -Around 35 students decide to continue a second night. Three demands have been made and posted upon their new blog. 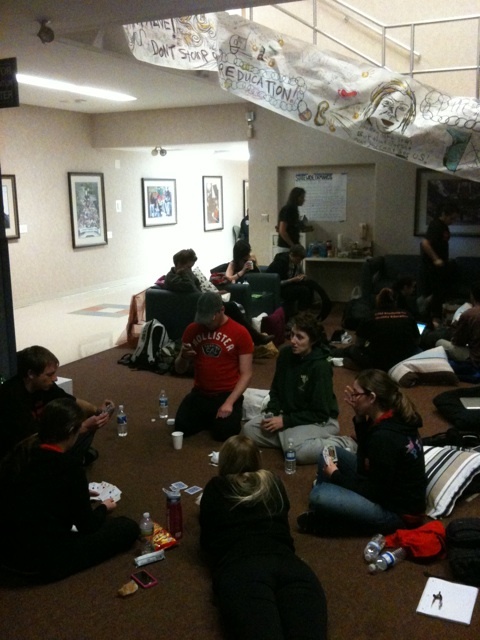 ~ 3:00pm: Students are still occupying the main administration building at Sac State. There are plans to stay the night and the occupiers will be releasing a statement soon. 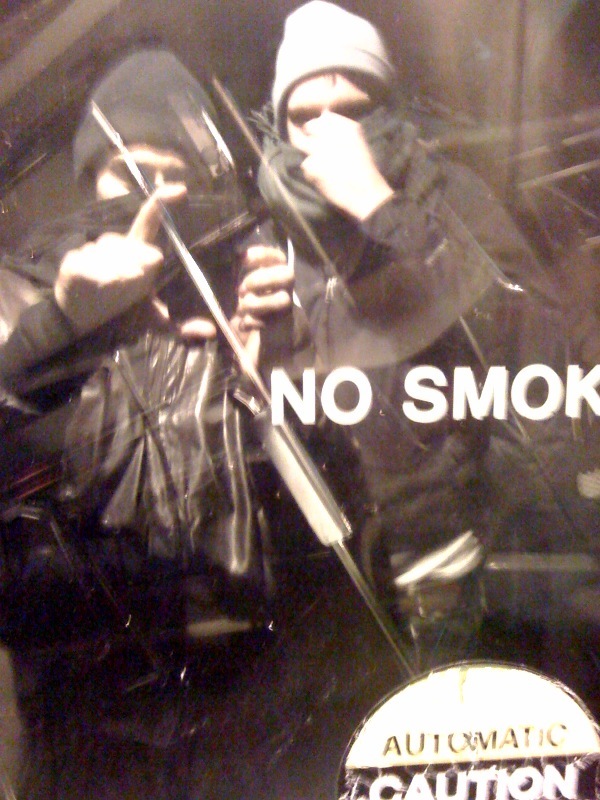 ~6:00pm: Occupiers are staying the weekend. More here. 6:15pm: The admin are saying that they are concerned for the health and safety of the occupiers, stating further that the air is unsafe and the conditions are unsanitary. The doors appear to be open now, but its unclear for how long. They are letting people out, but not in. 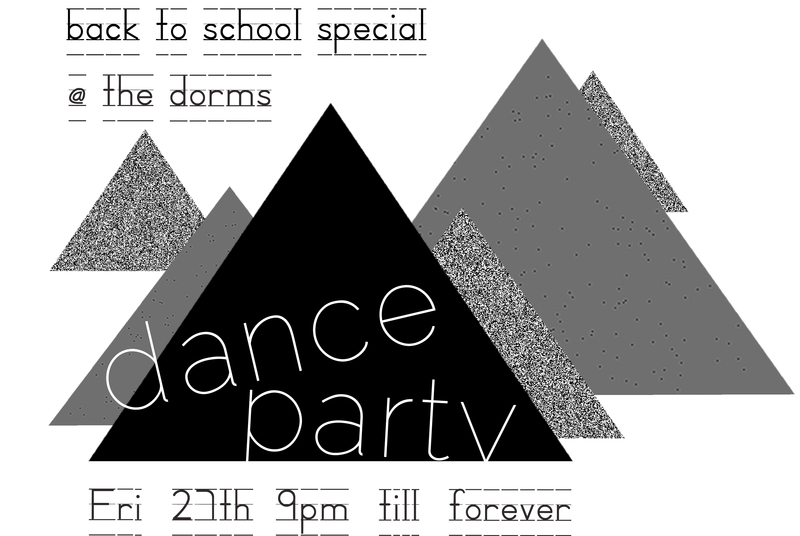 SAN FRANCISCO, California – Hundreds showed up for the first dance party on SFSU’s campus this academic year. At its peak around 600 people were present. 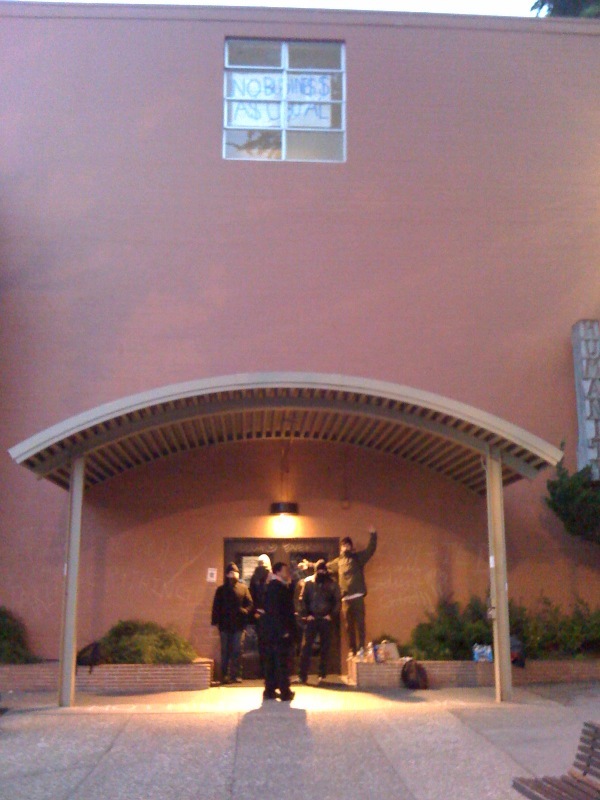 SAN FRANCISCO, California – Before dawn on December 10th last winter, occupiers of the SFSU business building were arrested. Since then, they have received over $700 in restitution charges by the university, each. As insult to injury, 10 of the students are now forced to pay part of it, $95, before a hold is removed on their registration for classes that began this week. They put a hold on their records without any sort of notification. In response to the political repression and student fees issued recently to Decemeber 9th occupiers @ SFSU, 30 students conducted a peaceful march from the Ethnic Studies building to the Administration building. Seeing as we had had a peaceful sit-in in this building before- we didn’t see the chance for any police confrontation upon entering the building. However, after approximately 15 students entered the building peacefully, cops illegally closed all the doors to the building, shutting the rest of the students out. The next few students trying to enter were met with physical confrontation by the police. One student was put in a chokehold by the police, and another was tackled and wrestled for around 30 seconds. Neither student did anything to provoke the police and both escaped without any charges or wounds, however we must not turn a blind eye to the violence conducted by the police at a peaceful action. Here are some photos from Indybay. More photos and news at SFSU [X]Press. In California hundreds of rallies took place (more than listed below). Other good sources: SocialistWorker, Indybay. 5:00am: Students out blocking streets at the intersection of High & Western, Hagar and Coolidge, and the western entrance of campus effective shutting it down. Only people on foot can enter campus. 7:00am: Some people have been hit by cars breaking the picket line, breaking someone’s leg and hitting another 3 or so people. Tan volvo plowing through strikers despite it was being let through slowly. The car accelerated as strikers were trying to control traffic flow traveling down High street. 9:40am: Currently a rally is being held at the main entrance (i.e. the east entrance) with 250 participants. For a while 2 helicopters were flying above. The students blocking the intersection of High and Western have left after most of the workers were blocked from entering campus (it would appear some dining hall workers were able to get on campus, but many others were unable to get on campus). Many of the workers are now here supporting the students. Earlier this morning, multiple students were injured by two separate incidents where cars rushed the strike line (one at the intersection of Hagar and Coolidge, and the second at the intersection of High and Western). The car at Hagar and Coolidge was tailgating a police car being let through, students then approached the vehicle to stand in front of it and tell them about the strike. The car hit the gas and drove into the mass, injuring a student’s leg, fortunately not broken. In the incident at High and Western, a tan volvo began accelerating into the crowd blocking the street, despite the fact that cars driving down High (away from campus) were being slowly let through. The volvo hit around 5 students, one student flipped over the hood of the car and over the top, breaking the rear window as the student fell off the back. As the volvo sped away, students kicked the car, denting it. Several cars and motorcycles have tried to slowly push through the crowd through out the day, but all failed. Rumors of other car incidents exist, but the others have yet to be confirmed. 1:00pm: Around 500 have rallied at the base of campus. Video below was taken around 12:45pm, the rally as of 1:15pm is still going. 1:55pm: Students are redistributing themselves around campus for maximum effectiveness. Around 60 people are at Hagar and Coolidge warning people that they may not be able to re-enter campus if they leave. They are also watching out for supervisors forcing workers to get onto campus still. 2:50pm: Strikers are now relaxing on the grass at the main entrance listening to a live band. 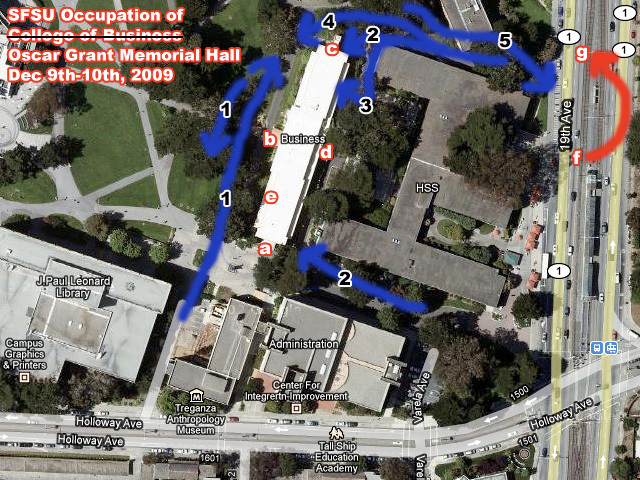 The strike is mostly split up into three locations, Lower Campus (Hagar and Coolidge), Main Entrance (i.e. East Entrance), and the West Entrance. 3:20pm: Earlier story about a prius running into students and driving onto sidewalk at High and Western has been confirmed. At least one student broke some fingers when the car recklessly plowed through the crowd. 6:30pm: The general assembly decides to take the protest downtown. 7:11pm: 300 Students walk through Pacific Ave.
7:30pm: The students have rallied at the clock tower. 1:20pm: Around 1000 people walking down telegraph (currently crossed at 66 ave.) for a rally with students from community colleges, CSU’s, and elementary school folks at city hall in Oakland. 3:10pm: The march has reached Frank Ogawa plaza. After the rally, protesters marched to highway I-880. Around 150 protesters were arrested. 7:00am: Most all of the ~40 arrested taken to North County Jail in Oakland out, charged with 2 misdemeanors and an infraction (obstructing traffic, unlawful assembly, failure to obey signs). 8:00am: Approximately 80 of the arrested at Santa Rita jail should start being released around 11am. They need rides! More photos on indybay here. 12:50pm: Students at UC Davis have shut down the bus terminal and the main street in Davis. 1:12pm: Students march down Russell st. and are now shutting down the freeway. 3:10pm: One student has been arrested, dozens of others have been shot by rubber bullets. They are currently on the street near the offramp and have been given a deal from the police stating that they will release the student arrested if they leave the offramp now. 3:30pm: Police using pepper spray pellets! 4:00pm: Students walking back to campus. 4:30: Students march through buildings pulling fire alarms, and from there they returned to Russell and La Rue where they shut down the intersection for several hours. 6:20pm: Outside supporters have been lead to believe that students sitting inside will be arrested. 6:40pm: Sit-in protesters all released. 1:50pm: Around 400 students are walking around campus urging others to join them in striking. According to OC Weekly, numbers increased to 800. 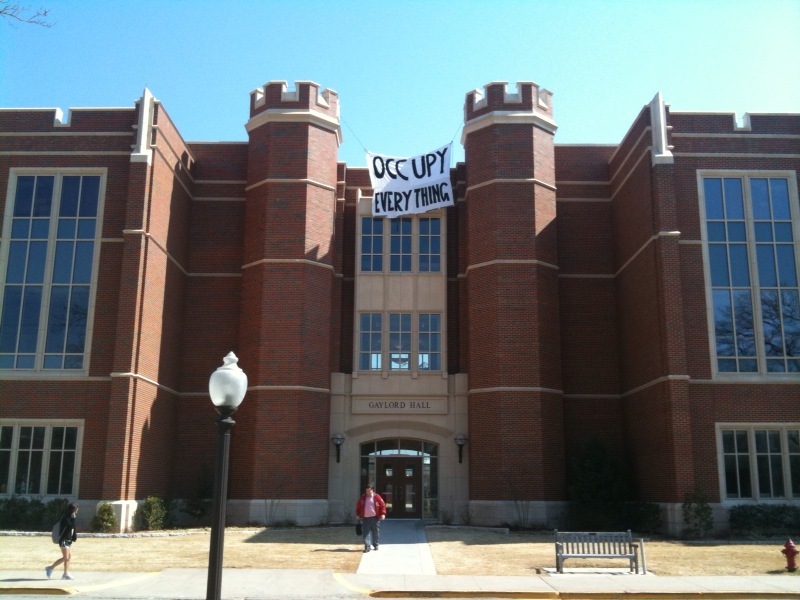 One of the largest protests in recent campus history. 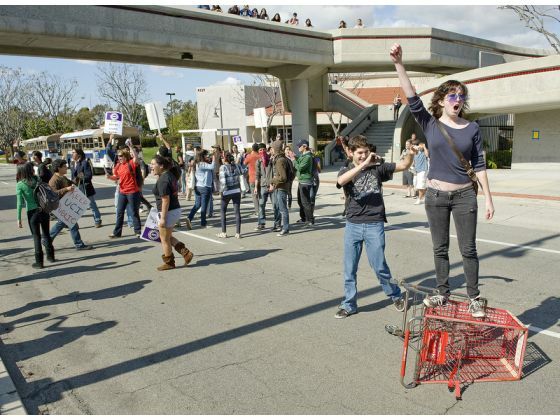 2:00pm: Students take to the streets and head towards freeway 73. Students clear one police line and continue down University Avenue. 2:50pm: Students gathering at Langson Library. 2:55pm: UC Irvine temporarily occupied with barricades at Langson Library. Students move to Gateway Study Center and lock down several doors before clearing out. 3:30pm: Students were unable to hold down the occupations, so they are now out and marching again. 3:45pm: Aldrich Hall, the admin building, was locked down with 15-20 police inside, so students held an impromptu general assembly in front of Aldrich. 4:00pm: According to one source, 2000-3000 people, another source 1500-2000, (mostly students, with some teachers and parents) marched from Balboa park to the Governor’s Office downtown. 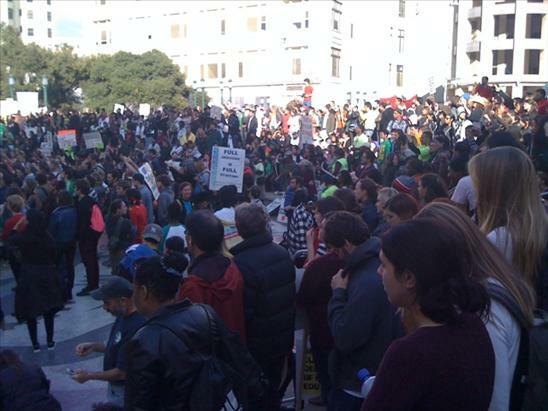 3:21pm: According to Daily Cal, somewhere near a 1000 students marching downtown. 3:40 PM – UCSB students, students and teachers from other schools gather at De La Guerra Plaza downtown, ~500 people take State St. for an unpermitted march down State. 4:00 PM – March has turned around and marches back up State, grows to ~1000 as it passes De La Guerra Plaza again. State St. is totally clogged with a massive march. 4:30 PM – Marchers arrive at the courthouse for a rally, with speakers including students, faculty and local politicians. Crowd disperses following the rally. They held a rally that ended at 2pm with 500 people. The rally later turned into a dance party. 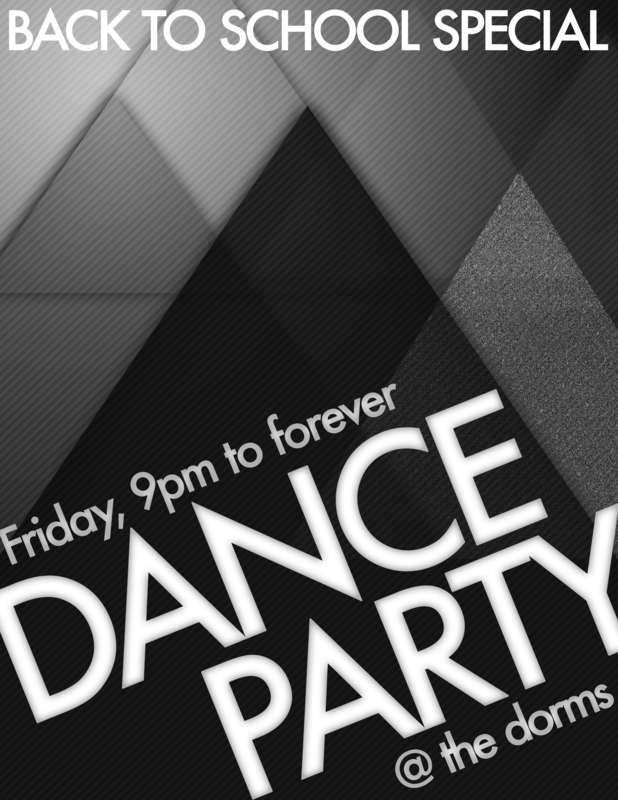 Another party is going to be held Thursday night at 10pm at Malcolm X plaza. 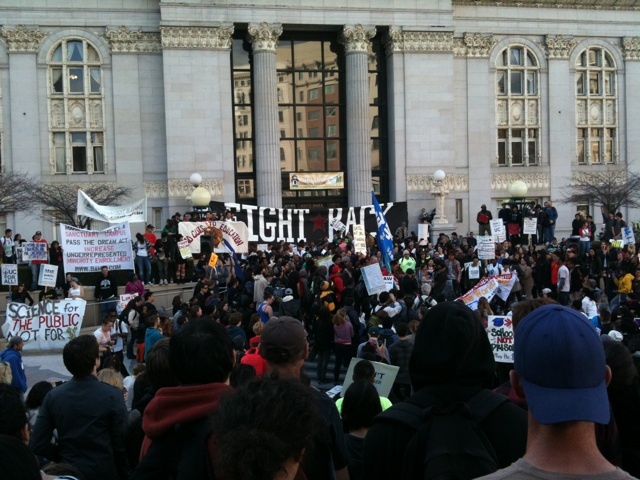 According to Socialist Worker, [20,000+] people are protesting at the civic center. 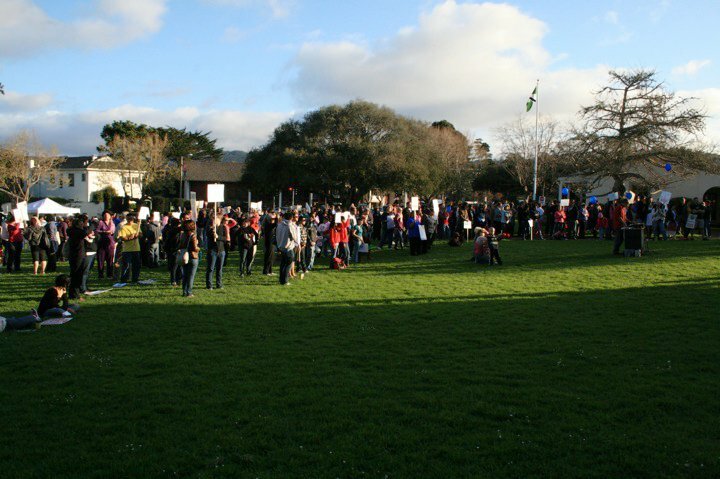 DailyCal says that a Rally with thousands come out for a “funeral service”. While Socialist Worker is stating that nearly 6000 come out for a protest in Northridge resulting in at least one injury and several arrests. Protesters are apparently waiting outside the jail. A few of us started organizing for the day around 10AM; making posters, mostly. Around 11:30AM, we ran screaming for a walk-out with noisemakers/pots/bullhorns throughout various campus buildings. A lot of people joined us and we marched to a nearby busy intersection (Nordhoff/Reseda). There was an invasion through the library and some more buildings with a long line of people calling for a walk-out. We met back at the busy intersection and invaded the center…police came soon and cleared up the streets. A few people refused to move. A couple local news stations came to report, and the occupation of the middle of the street continued. Around 2:30PM, we went back to campus and gathered a huge crowd on the Oviatt Library quad. 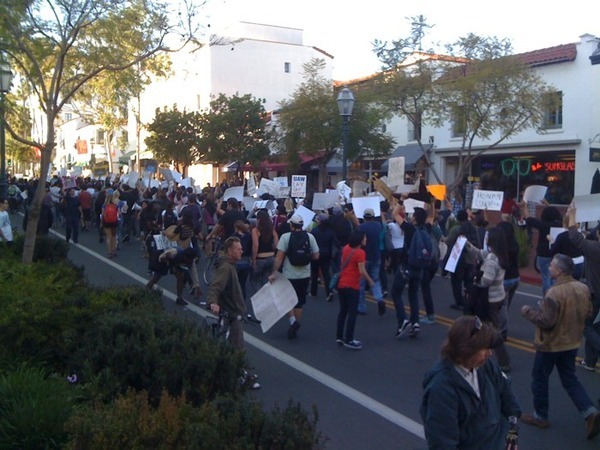 At 3:45PM, we began the march with CSU Channel Islands students/faculty. We all took to the streets and marched around campus. By 6:30PM, enough of us had begun an occupation of yet another intersection (Reseda/Prairie). This was when police threatened to arrest due to “unlawful assembly in the streets” and “trespassing.” A little while later, they began to threaten tear gas. Two people got arrested so far. By 7:30PM, five people had been arrested and one of our professors, 74-yr old Dr. Olsen, was knocked down and her arm stepped on by the police. She’s currently at the hospital. By 8:00PM, we invaded the space outside the library and talked to the media, reorganized, and planned for a press conference March 5th (today). Word started to go around that the students who got arrested were getting booked/released. Summary ? Huge misrepresentation by the media. Police not the nicest of nice. Lots of people from the surrounding community made this CSUN protest big. Anger at our president for misrepresenting what happened last night through her statement. Good energy going around those who were part of the event; plans of having CSUN fund buses for the March 22nd rally at Sacramento. 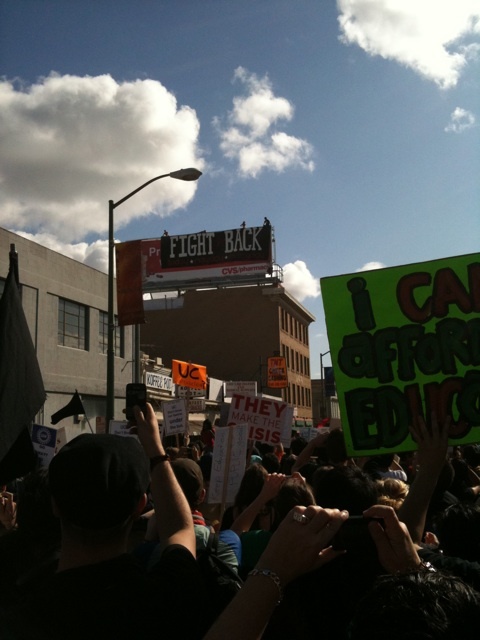 According to the blog EastsideLA, a March 4 rally started at CSULA which later traveled through parts of Los Angeles, through areas like Little Tokyo. Sometimes the marchers were on streets, other times they were corralled by police to stick to the sidewalks. 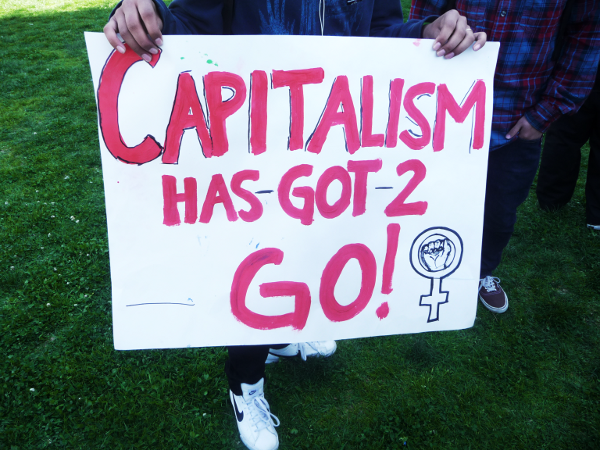 EastsideLA remarked how controlled the march felt, from both police and some organizers. They also commented how elements of the march were joyous and fun as such a protest should be. Crowd estimates appeared to be a little over a thousand. 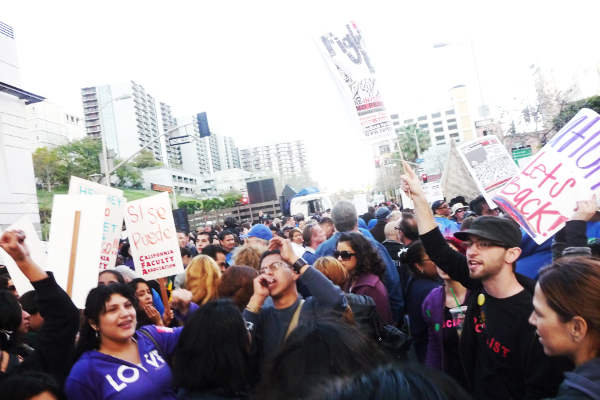 Los Angeles (general): Socialist Worker says 4000 rally in downtown. At noon several fire alarms were pulled and hundreds of people poured in to Humanities Plaza for a rally and march through the campus. Around noon, students, staff and faculty participated in a walkout and marched from either end of campus to a rally in front of the Student Center. A few hundred people attended the rally. Some student bands played throughout the day while students danced to the music. Student, staff, and faculty members spoke about cuts to public education and related issues, from spending money on wars and prisons to the systemic injustice that prevents so many people from attaining higher education. 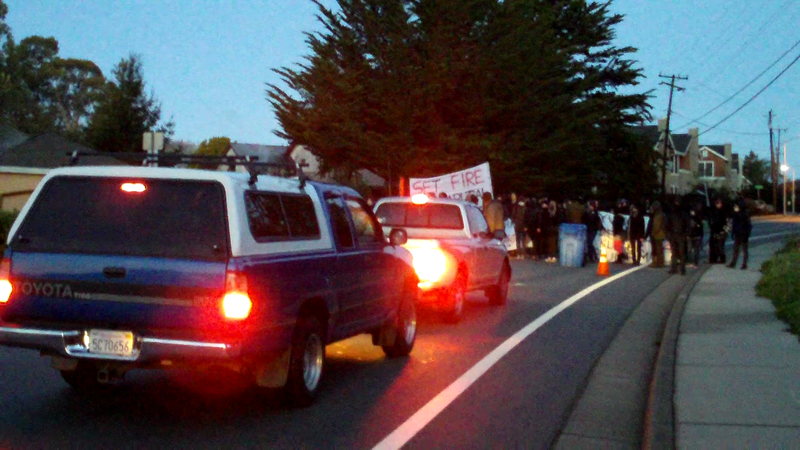 In the evening, some of the protesters from campus went to a community rally at Colton Hall (the sight of the first public school in California) in downtown Monterey. They joined people from local community colleges, K-12 schools, and members of various labor unions. 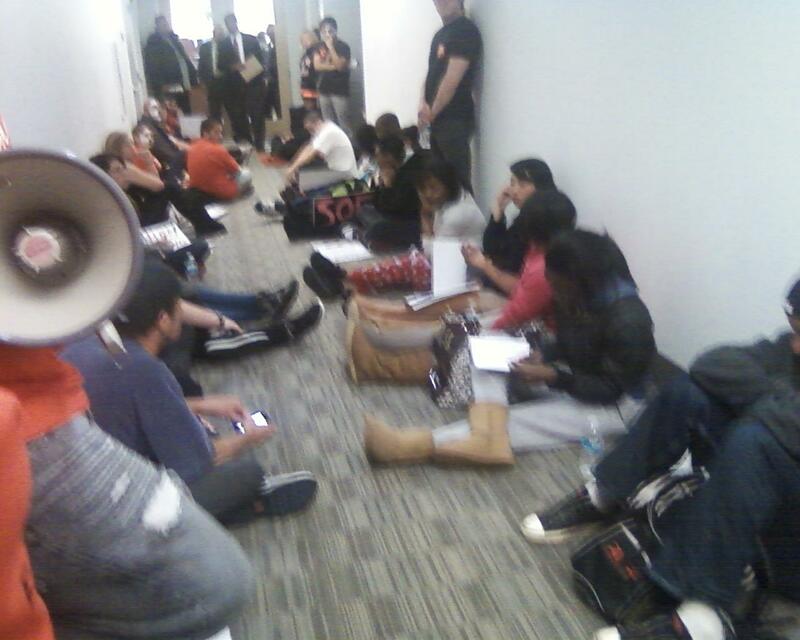 4:32pm: According to DailyCal, an occupation of administration’s offices with 30-40 people. 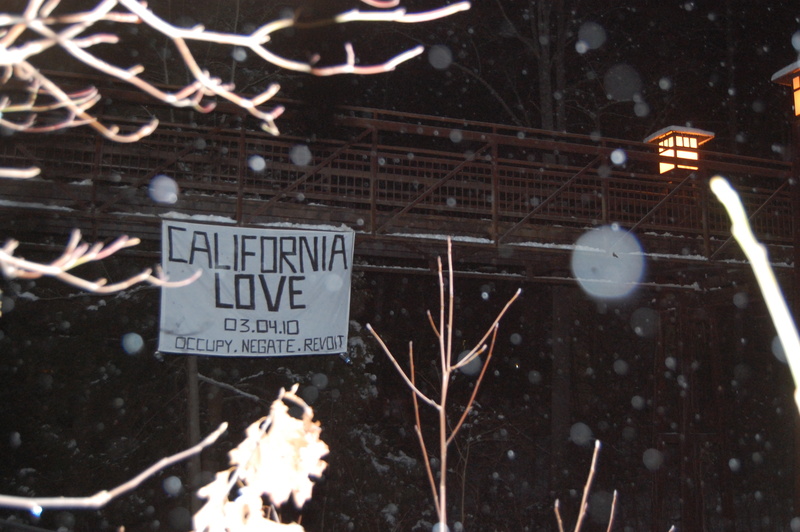 5:17pm: They say 32 occupiers still holding it down. 10:30pm: Occupation ends. Occupiers leave without being arrested. see indybay. Watch a video of an interview inside the Joyal Administration occupation. 500 march through campus and almost every building, then hold a rally. 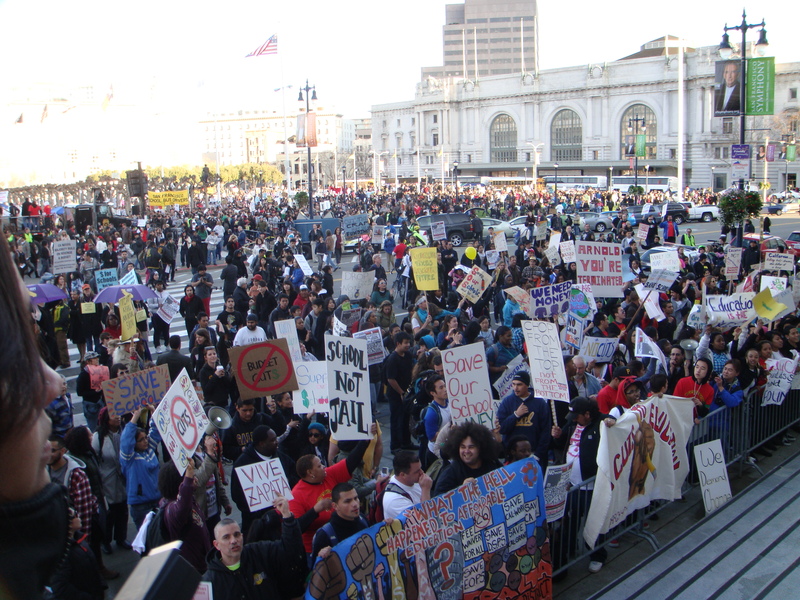 Carloads of Skyline College stakeholders join those at SF civic center. An original rap at CCSF. this is no exaggeration; let’s get rid of this abberation! Democracy (what? ),Tthat’s what the people is for! we’re WILD and free; we love it can you blame us? you about to get schooled! Around 200 protest, more from indybay. 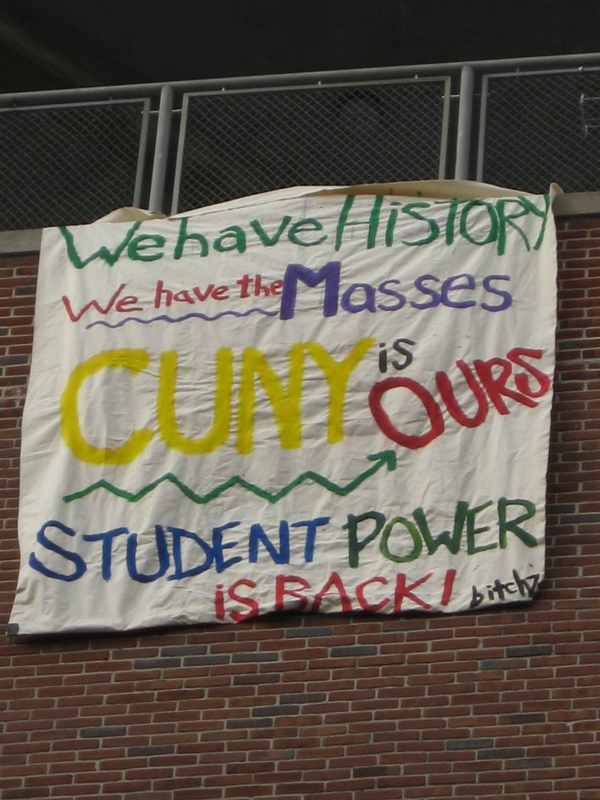 Solidarity to all students, workers and faculty! We ‘ve taken over the Student Services Building. We started on the bottom level, turning a meager rally into a protest-party on the inside.Students are chanting, singing, dancing. The energy moved upstairs to the second floor where a folk group is performing right now. Downstairs another band is about to play. We are holding space and reclaiming it as ours. We will not leave! WE are not leaving! This IS just the beginning! 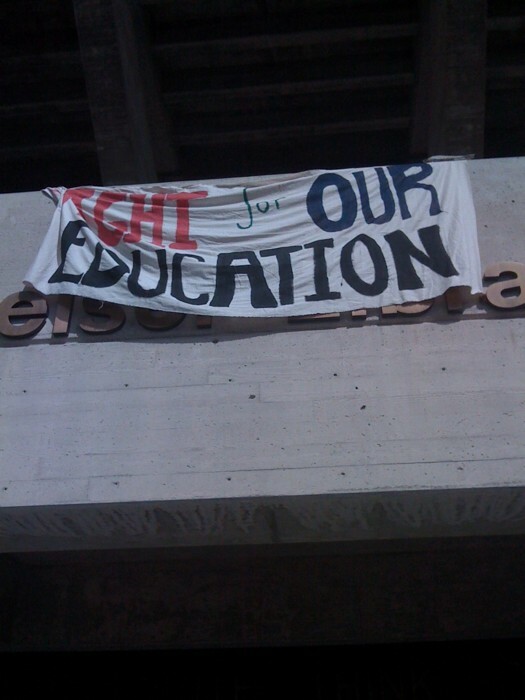 Slideshow & Audio from SUNY Purchase occupation. New York (general): Check out takethecity and reoccupied for updates. a big protest (~250), major police repression. 18 students arrested for trying to peacefully visit their chancellor! 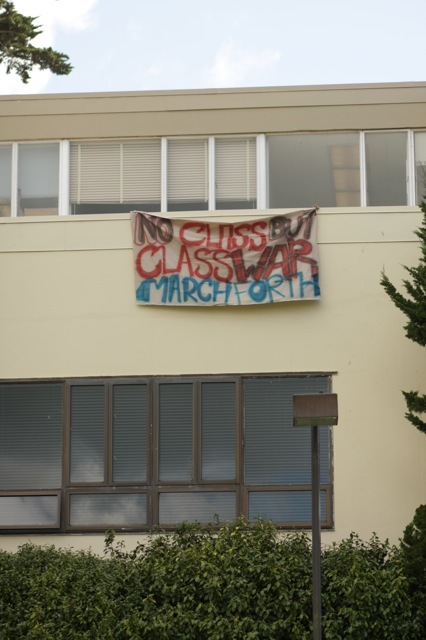 "No Class but Class War, March Forth"
This banner was dropped off of the Oscar Grant Memorial Hall (formerly known as the Business Building) last week at SFSU. On the morning of friday February 5th, a police detective of the San Francisco State university police came to the home of a woman involved in the student movement. He attempted to use intimidation and threats in order to acquire names of other students involved in campus organizing who “may commit violent acts.” The officer was informed that the police were the only ones have committed acts of violence and was asked to leave. TO SEPARATE THOSE OF US THAT HAVE FOUND EACH OTHER. We at san Francisco state intend to continue our work. We are not afraid of armed bullies and their tactics of intimidation. We openly proclaim our rejection of the life they prepare for us. 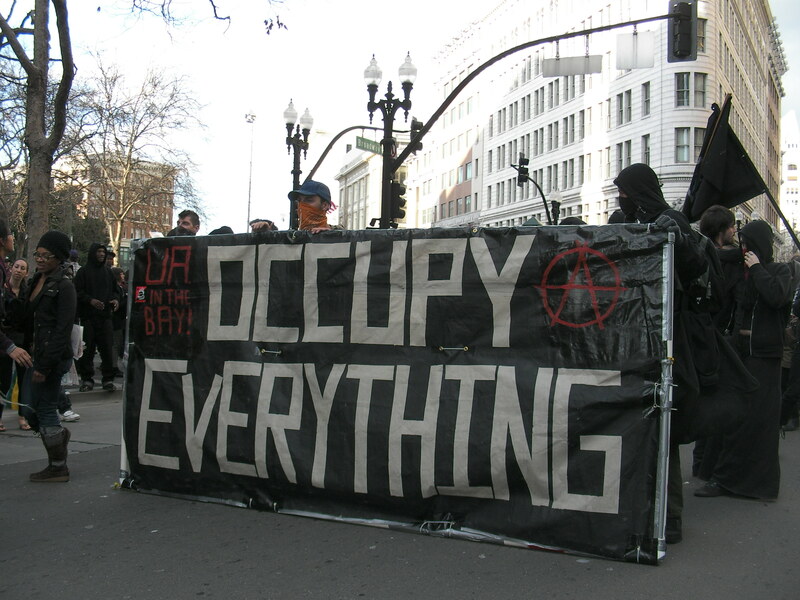 On the morning of December 9th, students at San Francisco State University occupied the business building on campus. Throughout the day and that evening, students on the outside stayed with linked arms in front of the door waiting for police to arrive. Early in the morning on December 10th, the police arrived in riot gear. Here are some photos (page 1, 2, 3) from the night and the morning of the arrests and map of how the police moved in on the building. By redefining and reclaiming these spaces, we expose the true violent nature of our society. 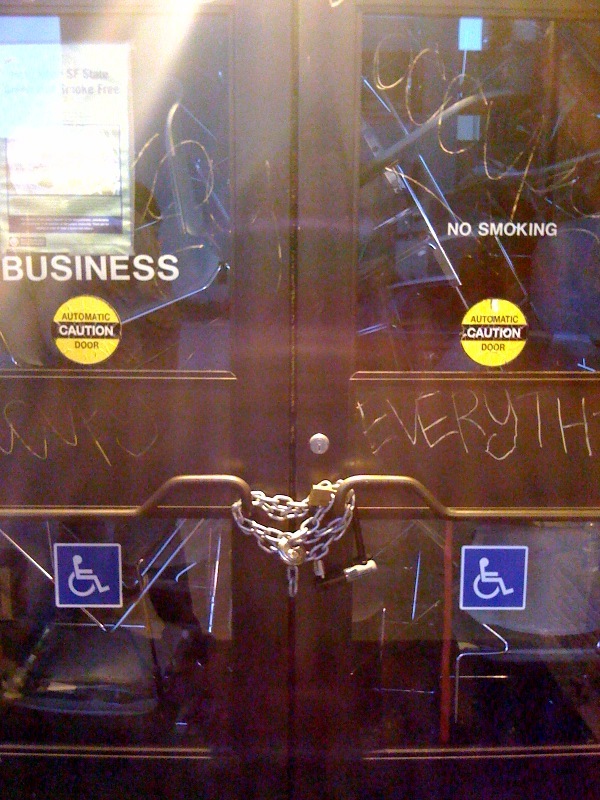 After escalated police violence on the UC campuses in Los Angeles and Berkeley, student occupiers rightly proclaimed that “behind every fee increase, a line of riot police.” In this structure, the Business Building of San Francisco State University, usually occupied by financial advisors for war-profiteering companies, there is no business as usual. Outside, the invisible hand of the market is holding a gun, revealing itself to us with a badge emblazoned “UPD”. The act of occupation is violent because it is a threat; we are not those who wield weapons, we are not those who possess the means to subordinate people to not just physical violence, but the psychological violence that disempowers us to believe that we do not have the power to resist and fight back. 8:50am: occupation of the business building is still going. About 30-40 students inside the building, and another 50 outside. The response from students seem to be positive as students are just arriving for classes. early wednesday morning. sign reads "no business as usual"
10:20am: the building is still occupied. 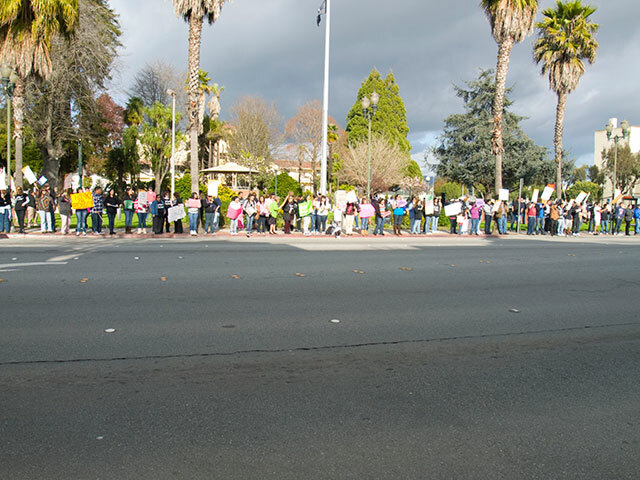 Approximately 80 students are on the outside in support. Apparently little contact between the people inside and the people outside. 10:40am: No major police presence yet. So far only 2 police officers are present. 1:50pm: No real news to report. 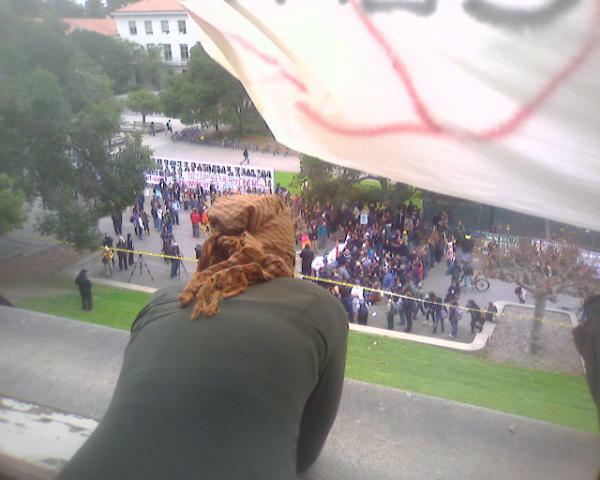 According to the occupySFSU twitter feed, they released copies of their demands from the rooftop, but we have been unable to find a digital copy of the demands. The building is still locked down and supporters are still present outside. 9:07pm: The building is still locked down. There are about 20 students at each entrance with linked arms (4 entrances). A dance party has begun at once of the entrances. 1:00am: The building is still locked down. About 80 students are still present, many of them still dancing. ~4:00am: police break into the business building and arrest individuals inside. Some students outside linking arms were also arrested. Other supporters followed the arrested individuals onto the street, 19th avenue. 19th avenue is blocked off for an hour by the police/students. Eventually the police (in riot gear) leave the street allowing vehicles to approach the students sitting in. The police announce that the arrested individuals are only going to be cited/ticketed then released, but can only do so once supporters vacate the street. The protesters leave the street and some march over to a parking lot where the arrested individuals are being held. The last student is released around 6am. 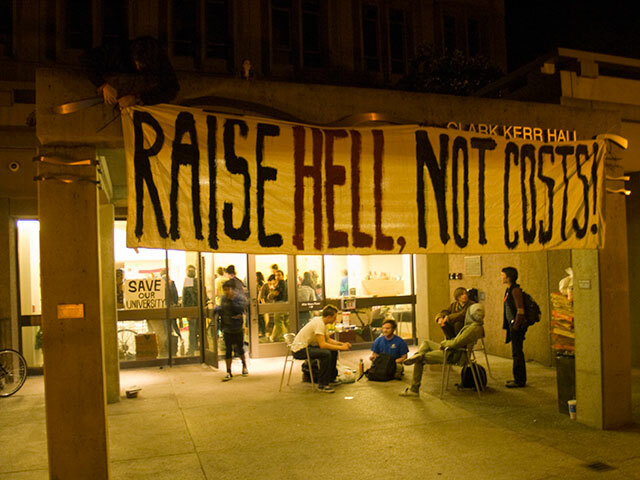 The Regents of the University of California voted, at UCLA, on 32% fee increases for students from November 17 – 19. (The CSU trustees are also meeting on these dates). 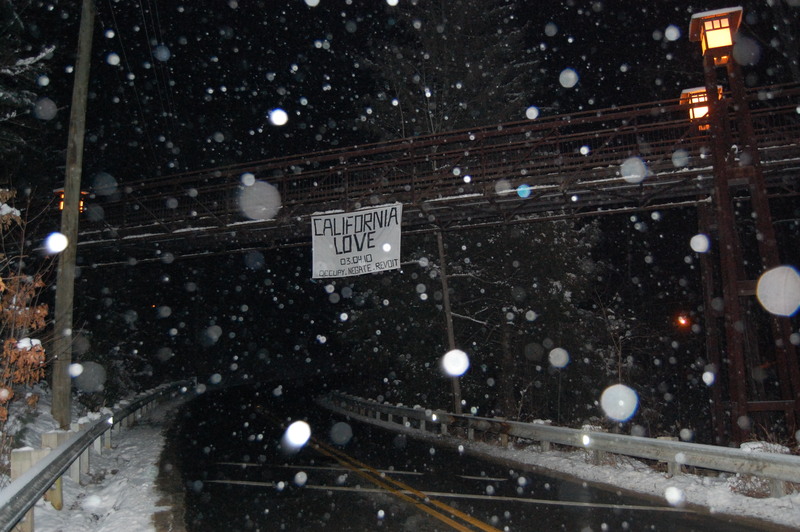 Students through out the state of California are in an uproar. UC Santa Cruz: over 500 students are occupying the Kresge Town Hall as of 3:45pm, Wednesday. the details: hundreds of students rallied at the two entrances to campus shutting it down for several hours. Another group of 300 students entered into the Kresge Town Hall to create an organizing space around the budget cuts. Later in the evening, students at the entrances joined the others in the Kresge Town Hall. Currently, the space is being used to plan further actions. 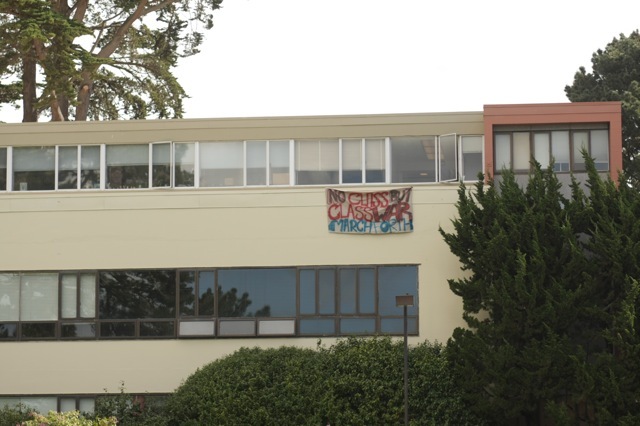 UPDATE: As of 3pm, Thursday, UC Santa Cruz’s main administrative building, Kerr Hall has been occupied. Check out this indybay article! Thursday 5:45pm: still occupied, discussing the night. Thursday 6:30pm: Alma Sifuentes, Dean of Students has arranged to not call the police (the time frame is unclear) as long as students remain non-violent and do not create physical barricades. Thursday 6:50pm: The administrators refused to provide a written-copy of the previous agreement. Friday 12:00am: Students are still in Kerr Hall (~200-300) and another 50 students are in the Kresge Town Hall watching revolutionary films. Kerr Hall is absolutely packed, there is very little space to even sit down in! Friday 4:00pm: No police action imminent, however such has been implied by e-mails sent from administrators. The Academic Senate is meeting and have been discussing the fee hikes, the issues around child care at UCSC, and the occupations. The administration has also cut off internet access, in both wireless and wired forms, which not only potentially demonstrates the administration’s attempt to silence occupiers, but has very realistically damaged student journalists’ ability to report information and upload relevant videos online. Friday 4:50pm: A correction, a single internet connection appears to be available in Kerr Hall. Saturday ~1:00pm: students are in negotiations with administrators. The buildings are still be held. No police presence. see Demands in english below! Demandas en Español! UC Berkeley attempted an occupation on Wednesday. 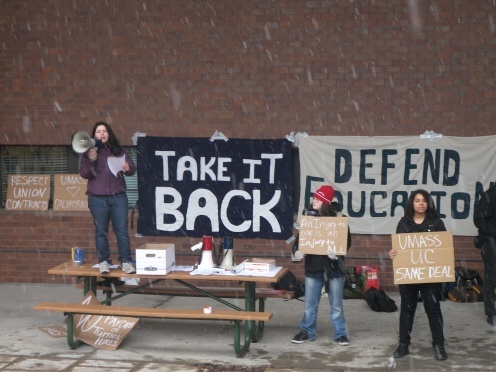 Students have been organizing massive actions through out these three days as well. some students, all demonstrating peacefully/without weapons, have been beaten by police! Friday ~8:00am: Students are barricaded in a classroom or floor, while police attempt to pepper spray through the doors. Students are making announcements from the windows. They need outside support! Friday ~9:15am: About a 100 students have gathered outside to support the students inside. They need more supporters! The police are responding violently against the occupiers! 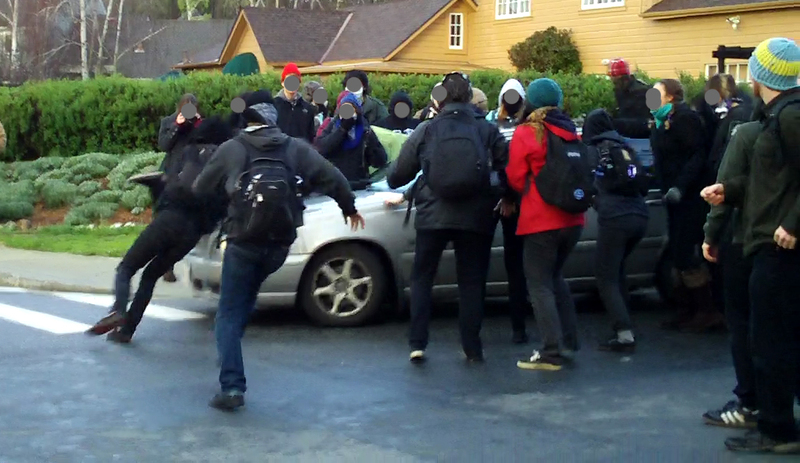 Friday ~11:00am: from indybay: Police keep attacking to get in, but the doors are holding strong. Outside a solidarity demonstrator was arrested.Cops sprayed pepper spray through doors earlier and injured an occupier with a baton. If you can get to UCB now, please come and show support! 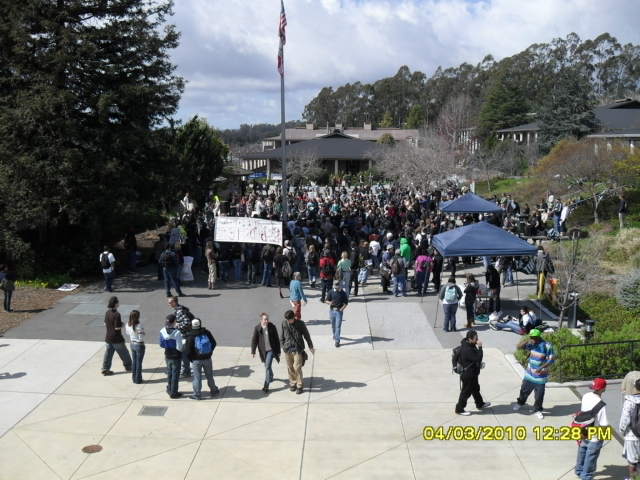 Friday ~2:45pm: According to one source, students are in negotiations with police or administrators. They have been given a choice of either having amnesty for all the occupiers or that the approximately 38 workers recently fired are rehired. Friday 5:10pm: SWAT team is moving in on the barricades! Friday 5:17pm: SWAT has broken the barricades and are arresting students! UC Berkeley Occupier’s blog & updates about the actual occupation here. the details: students at UCLA held a “crisis fest” on Wednesday night. At 12am, students go and occupy the campbell hall and rename it the Carter-Huggins Hall, after two black panthers that were murdered in the building. As of this morning the building is still occupied. Thursday 7:00pm: UCLA has ended their occupation, with 100 people, peacefully. SFSU held a sit-in, that has now ended. See Indybay. Thursday ~6pm: UCD is still occupied. However students are not being allowed enter. Mrak hall is being surrounded by police and helicopters. Friday 10:10am: A total of 52 people were arrested, including one professor. They were held for 14 hours in lock up. They’re out now and most of them are doing okay. One student was falsely charged with assault and battery, the rest were charged with trespassing. CNN has been running video clips of police brutality all morning. Their sentiment this morning was to get back to campus and continue fighting back! Friday ~7:20pm: ~100 students entered their library & occupy it. Details at indybay.